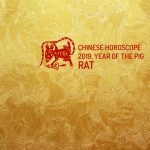 The Chinese Horoscope 2019 for Rat predicts a great growth of the social circle in which you move, that will allow to be a broadening of the objectives in which to focus your operations. It will be the year in which this Chinese zodiac sign will have to concentrate on putting an end to those projects that were open in the last two seasons and that needed a final push to be finished. This will require determination. Without it, things are never done. Those who were born in the years 1900, 1912, 1924, 1936, 1948, 1960, 1972, 1984, 1996 and 2008 are part of this Horoscope. Although last year was not a good time in terms of social relations, this one is fantastic for the emergence of new friendships that will lead to good partners in the future. Your good deductive ability and the ability to communicate with others will turn you into rising values in the professional environment in which you move. However, you should also not ignore any offer of help that comes from any friend or partner. Thanks to this, you will also grow on a personal level. According to the Chinese Horoscope 2019 for Rat, the steps of initiative and reinforcement taken the previous year will bear fruit during the first six months of the year. There will be peace and love in the relationship, generating an ideal time for pregnancy to occur. Differences may arise between the spouses that will require effort on both sides so that the waters can definitely return to their course. The relationship with your relatives will be much better in the last quarter of the year. In the previous ones you will have to be aware of solving any problem as soon as it comes up, thus preventing that problem from going any further. That is why it will be fundamental to know your defects and strengths in order to know how to lead family relationships in the best possible way. It is possible that you will experience minor health problems during the second half of 2019. That is why it is important that, in the Chinese Horoscope 2019 for Rat, you know how to avoid excesses during the first part of the year so as not to suffer eventual relapses later, in the second half. Therefore, the Chinese Horoscope 2019 for Rat is very interesting and fruitful at a social level and quite acceptable at a sentimental, family and health level.